Refreshing, satisfying and light. 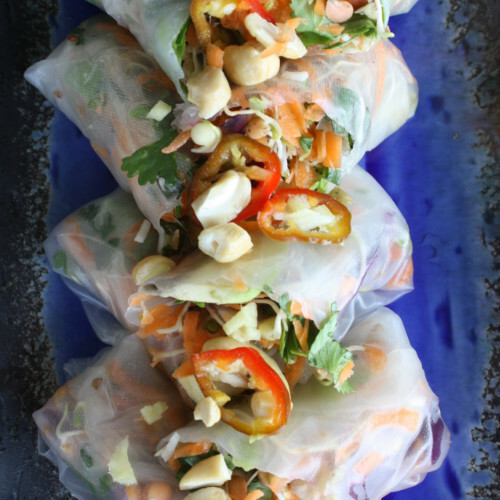 These summer rolls are a savoury treat for the taste buds that will be a welcomed healthy addition to any occasion, or great as a packed lunch. Packed full of vibrant phytonutrients and fibre – you won’t get that sluggish feeling eating one of these! You can make these ahead of time, or have the various ingredients laid out on the table for people to create their own! Make the salad filling by combining the grated carrot, cabbage, bean sprouts, and herbs in a bowl. Combine all of the ingredients to make the sauce, and place in a serving bowl. Take a large bowl of warm water and add a wrap one at a time. When rehydrated, place the wrap on a plate, add the salad and top with a slice of avocado and some crushed cashews. Fold in the ends and then fold around the sides to wrap your filling, don’t over fill or this will be very tricky! Continue this process until you have filled all of your rolls. Any leftover ingredients can be wrapped for your lunch tomorrow!